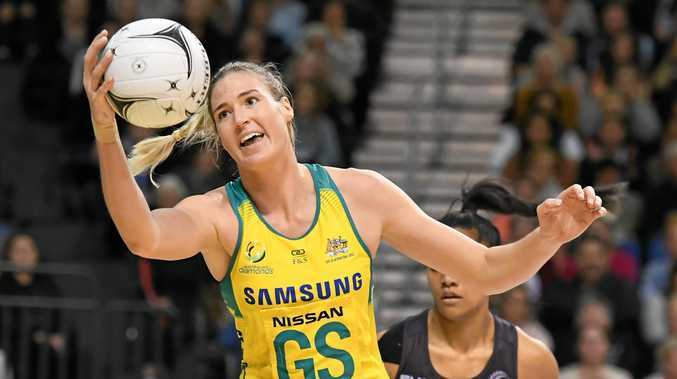 NETBALL: Despite being ranked the best in the world, Sunshine Coast Lightning goal shooter Caitlin Bassett believes the Australian Diamonds will enter the upcoming Quad Series as "underdogs”. The Diamonds faced a tough loss to the New Zealand Silver Ferns during the Quad Series last year, but fought back to dominate and win the Trans-Tasman Constellation Cup. However, the Diamonds captain believed the England/South Africa leg of the series, which starts next week, would conjure up even more challenges this time round. "I don't think we go in as favourites,” she said. "We lost the Quad Series which was really disappointing for us at the end of last year and so I see ourselves a little bit as underdogs. Coming up against her Coast teammate and England Roses defender, Geva Mentor, on her home turf would also prove a difficult test, according to Bassett. The duo aren't the only Lightning stars facing international duties, with Stephanie Wood (Australia) and Karla Pretorius (South Africa) also on the international stage. Bassett has entered the new year on the cusp of an intense international schedule, with the Commonwealth Games also quickly approaching. "I sat down with Noles (Noeline Taurua) and Kylee (Byrne) at the start (of pre-season) and said I actually just want to focus on one month at a time. She will enter a Commonwealth Games-focussed camp with the Diamonds prior to next week's Quad Series. "(But) We don't want to get ahead of ourselves, we've got a lot of work that we need to do when we're on tour in January and it's going to be a tough series,” she said. A series which she believed would also prove invaluable preparation for the Games. "People probably think putting this travel on at the start of the year is not a smart thing but for me personally, it's a sense of relief getting out there and playing against these international teams leading into a big competition,” she said. Being the number one side in the world came with plenty of expectations for the Gold Coast, but Bassett said the Diamonds had embraced the title. "It's great to have that pressure and be world number one and we always have that target on our back,” she said. "But I think between us, England, New Zealand and Jamaica there is a real fight in that top four and a lot of talk up has been happening around England which I think has added a lot of pressure for them.